With the beach just footsteps away, Pelican's Landing is situated on Myrtle Beach’s acclaimed Shore Drive, and is a great place to have a family-friendly vacation or romantic getaway. 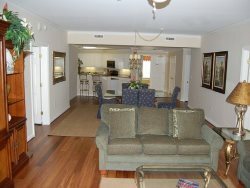 Come enjoy fantastic oceanfront beach views in this beautiful fourth-floor three-bedroom condo. This condos classic beach decor is high lighted by a skylight in the living area, comfortable furnishings and a flat-screen TV in the living room. Pelicans Landing 404 sleeps eight people with one king, one queen bed, two twin beds and one queen-sized sleeper sofa. Additional features include a washer/dryer, wet-bar area, 3 TV's, one VCR, one DVD and one CD player.Wireless Internet available NO MOTORCYCLES ALLOWED Limit two parking spaces per unit New this year is new flooring. Look Great! Pelicans 404 is located on the Ocean side, directly across the street from the office on the 3rd floor RESERVATION DEPOSIT: 30% of the reservation amount is necessary to confirm a reservation, and must be received on or before the above indicated cancellation date or the reservation will be automatically canceled. Credit Card payments are necessary when your arrival is less than one month away. Personal checks are acceptable only if received 30 days prior to arrival date. When deposit is made, there is a 24 hr opt out at no cost.